Bending properties of composite materials are commonly tested according to DIN EN ISO 14125, DIN EN ISO 178 and DIN 53293, using a three point or four point flexural bending test device. 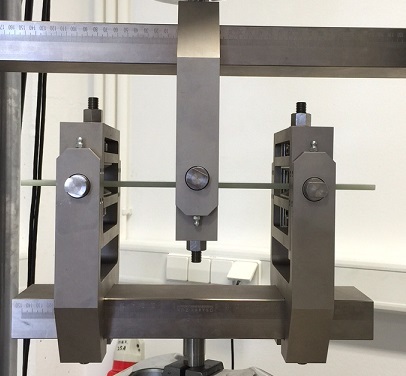 The flexural tests provide values for the modulus of elasticity in bending, flexural stress, flexural strain and the flexural stress-strain response of the material. The test method involves a specified test fixture on a universal testing machine. The sample is placed on two supporting pins a set distance apart and a third (three point) or fourth (four point) loading pin is lowered from above at a constant rate until a given deformation or until sample failure. The major difference between the two methods being that the addition of a 4th bearing brings a much larger portion of the beam to the maximum stress, providing a constant distribution of strain and deformation, as opposed to only the material right under the central bearing. Between the test fictures and the loading pins a shear stress is applied. It is mandatory to keep the shear stress lower than the tested material’s shear strength. Within the test area there is no shear stress at all. 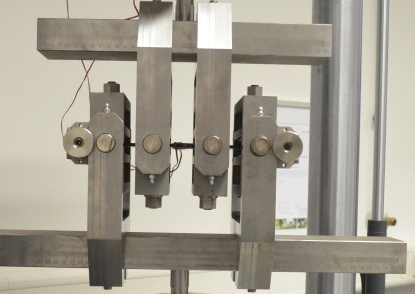 Besides the static flexural test we also offer dynamic flexural testing, using our innovative dynamic flexural testing device. We are happy to give advice on characteristics of flexural testings. Our newsletter is published about six times a year.